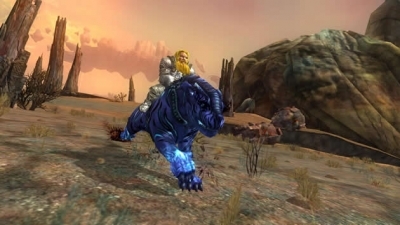 Beginning today, EverQuest II players no longer need to save plat or chase retail boxes to achieve the status and performance boost that comes with roaming Norrath on a mount. Fueled by player demand, Sony Online Entertainment LLC (SOE) is giving players the opportunity to purchase a mount through the Station Cash Marketplace for the first time. The all new Stonebrunt Prowler mounts are available to purchase for only $25.00 in-game now. Residents of Norrath can choose from three different types of Prowler mounts which are guaranteed to be available for at least one month. The Stonebrunt Prowler is a fearsome predator with strong jaws and deadly speed, and has been known for stalking the plains of Odus. Since Odus was pulled from Norrath, the prowlers have mutated, with magic infusing their bodies and improving their already powerful muscles. Recently, Erudite researchers have found ways to bend the prowlers to their service, taking control of the magic essence of each prowler and harnessing it for use as a mount of unparalleled ferocity.